We're seriously back-logged for this blog but I can assure you that both Drew and I have been scouring our individual cities for yummy tea drinks. 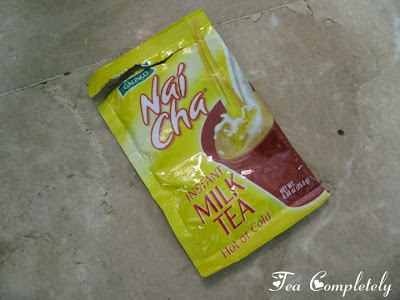 Saw this instant tea milk (Galingco Nai Cha) the other day at the grocery so I got one pack to try it out. I dissolved it first with some hot water before I added cold water and ice. My take? Good thing I just bought 1 pack. Awww yeah we are severely backlogged. Hope we can catch up on our blog posts. Anyway, how does this compare to Lipton Milk Tea? Never tried that yet. I liked Lipton's milk tea better than Galinco. But the ones my brother bought in Hong Kong were even better than Lipton, in my opinion. @Joey may I know what brand he got for you? The foaminess was great (no need to pull too much) and concentration was great - 1 sachet was well enough for 1 big mug!